Calvert County - Events, Real Estate, Recreation, Food & Drinks, & More! I first experienced Solomons with a quiet walk along the waterfront passing by the J.C. Lore and Sons building unaware of its significance. I enjoyed the peaceful atmosphere with water flanking both sides, the sea breeze, and the small businesses and eateries along the edge. It never occurred to me that Solomons had been anything more than this quaint small town surrounded by water though many of you remember it quite differently. I learned a lot at my recent visit. Now a National Historical Landmark, the J.C. Lore and Sons seafood packing company has been around since 1888 and until nearly 40 years ago, Solomons was a major seafood packing and boat building town. Now the Calvert Marine Museum opens the old Lore Oyster House to visitors offering free tours and special Oyster Days for children. The building itself is smaller than I would have imagined, so it doesn’t take long to tour. 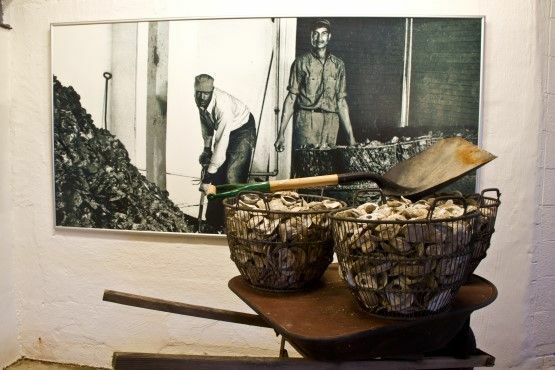 A short video explains the history and staff will happily answer questions as you walk through the packing room, the upstairs offices, and the large open room where oysters would be dumped in piles as they arrived. Sitting on the water, the building floods with the tides, so on during high tides, it may be closed. 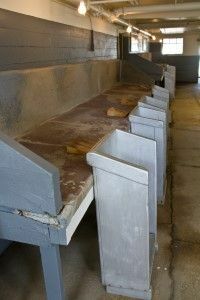 The shucking room was my favorite. My girls stood up on the wooden stools where shuckers once shucked up to two gallon oysters an hour while others quickly brought in fresh oysters and hauled out empty shells. Behind the house on the water is the Dee of St. Mary’s, a skipjack once used for dredging oysters and now used for river cruises through the museum. The rooms now are fairly sparse, so bring the kids and don’t worry. Children can explore and learn about this part of Calvert’s history. A wall of oyster shells will help identify what you find on the beaches here and after a 30 minute visit, you still have time to walk the waterfront and have a nice lunch at one of Solomons’ delicious restaurants. Do you remember Solomons when it smelled of fish and the oyster house was in its prime? Please comment. I’d love to hear your stories. I moved to Maryland in 2011 after living overseas for 6 years. We chose Calvert for the award-winning schools, nice houses, and reasonable commute. Moving to the country, I really had no idea what I'd find, but have been continually surprised by the local treasures that I find not only in the local restaurants, but in the people, places, and cultures that make up this unique place. You can read more about my travel and food adventures at verbosevagabond.com or see me on G+.